aamra companies is recently acknowledged as the best employer brand for providing outstanding results based training facilities which falls a positive impact in the society as a whole. The recognition is accredited by CHRO Asia for the 6th time in a row since 2014. The company received 3 awards in 3 different categories at Asia’s Best Employer Brand Awards 2017 held at Le Meridian Sentosa, Singapore. Employer Brand Association (EBA), World HRD Congress, Malaysia Institute of Human Resource Management (MIHRM) and CHRO jointly organized the auspicious event. Employer Brand Association (EBA) and CHRO recognized aamra companies as one of the top 50 “BEST EMPLOYER BRAND OF ASIA” for the year 2017. 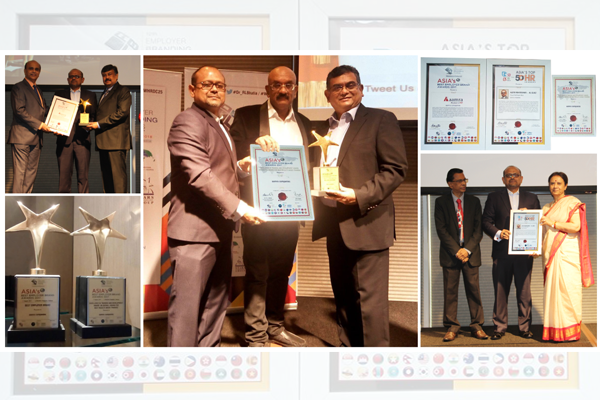 World HRD Congress and MIHRM awarded aamra companies with ‘’EXCELLENCE IN TRAINING & DEVELOPMENT‘’ recognition for ‘Best Results based Training’ which was rendered through its unique initiative ‘Believe in Bangladesh’. The Group Chief People Officer (GCPO) of aamra companies Ajeyo Rohitashwo ~ Al Quazi also awarded with the “TOP 50 ASIAN HR THOUGHT LEADERS” award by CHRO Asia and World HRD Congress. The Award recognizes exemplary HR leaders for their commitment to excellence, developing best practices and innovative strategies for engaging generation z.
CHRO Asia is a high level professional body that acts as a Global Platform for the Human Resource Heads. The selection of the awards winner was undertaken by an internationally recognized panel of judges which constitutes professionals from different parts in Asia scrutinize applicants with strict discipline. These awards underline aamra’s position as commendable corporate citizen that has established a distinct identity through its best practices, policies and strategies.